Beyul Travel and Treks organized a week-long volunteer trip with twelve participants from the United States that started on April 22nd 2018. In partnership with Gham Power, Grid Alternatives, Empower Generation, Kalpavriksha Greater Goods, and the Mrigakunja Bufferzone Committee, the volunteers installed solar panels at a wildlife observation tower in the Chitwan National Park buffer zone in a team effort to support the Committee’s environmental endeavors and the community. 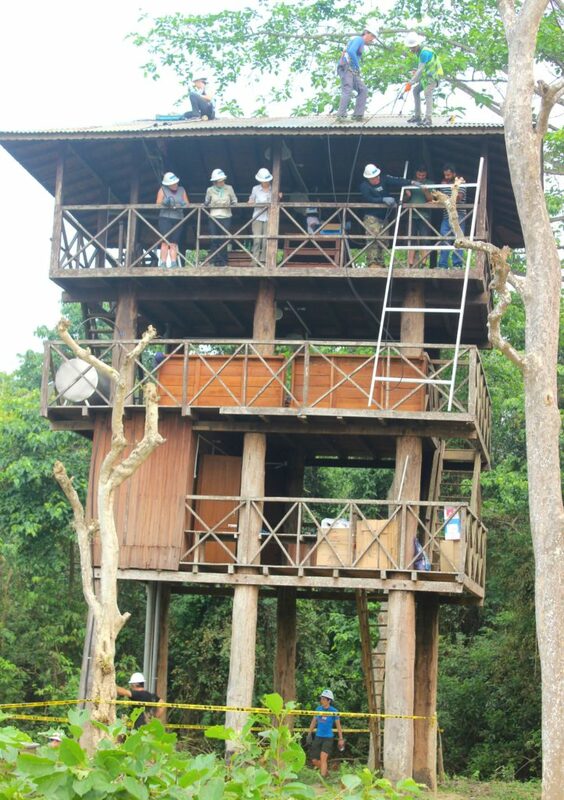 Four solar-powered towers now stand in the jungle and accommodate both foreign visitors and locals for overnight stays while also providing an incredible opportunity to watch and monitor the wildlife. 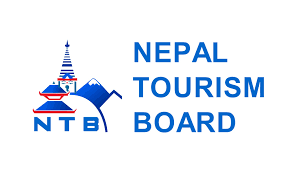 Before going to Chitwan, the participants witnessed the hustle and bustle of Kathmandu and visited UNESCO World Heritage sites, Swoyambhunath and Patan. Not only were they fascinated by these monuments’ architecture, but they were also captivated with the rich culture of the capital. Next day, we took a twenty-minute flight and quick bus ride to Sauraha, a town just outside the buffer zone, where the group stayed overnight to adapt to the flat, hot, and humid terai lands of Nepal. On the first day at Sauraha, we visited Mrigakunja Bufferzone Committee’s office, where elected committee members gave a presentation about their conservation work, describing thoughtful programs, goals, and solutions that benefit both their communities and the jungle. 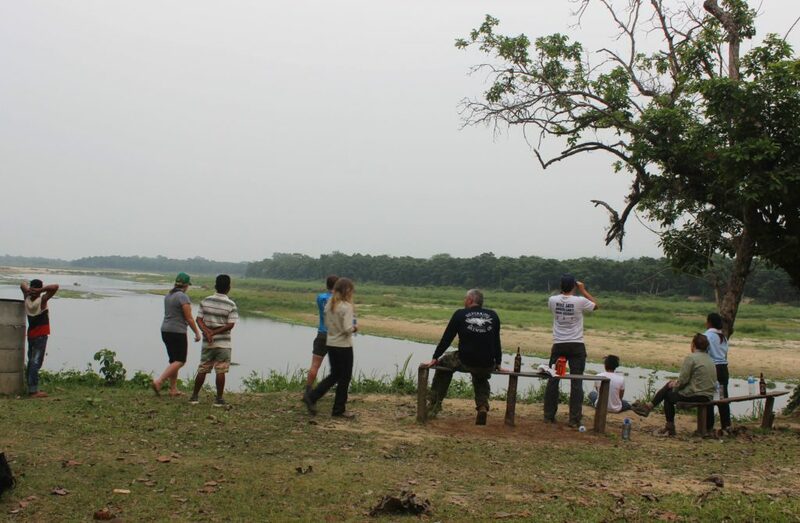 They’ve been leading an impressive preservation effort in Chitwan National Park. Furthermore, the participants were greatly impressed by the gender equity evident in the Mrigakuna Management Committee. After the inspiring presentation, we visited a few local artisans who had been trained through one of Mrigakunja’s programs and contemplated their beautiful wood-carved statues of rhinos and elephants. We then returned to the hotel where we planned for our installation at the tower the next day, but not before enjoying beverages by the pool and a refreshing swim. We then stayed for two consecutive days at the tower within the buffer zone. It was a bit hot and humid on the first day, so all of us were a bit drained. However, the participants’ energy and seriousness towards the installation was terrific. The care and intimacy among all of us could be felt by everyone around. Beyul arranged for a kitchen team to make meals at the tower, so we had breakfast, lunch, and dinner all together in the middle of the jungle while watching Rhinos take baths by the river and listening to peacocks singing and dancing. We were having the time of our lives. Just beside our tower was a river that had a number of crocodiles, gharials, and river turtles. We completed the installation within schedule. When the system was hooked together and the lights and fans turned on, everyone rejoiced in our shared sense of achievement. We felt proud to have been a part of this valuable installation. Then, chatting by the bank of the river with some Gorkha Beer, we shared some laughs, and just like very good friends, we heartily teased each other. We witnessed a couple of wild animals, such as wild boars, deer, musks, a rhino with a baby rhino, a wild elephant (widely known in Nepal as Ronaldo), and heard roars during the night. We hiked to Sauraha next day, and during the walk, we witnessed more animals running by the road. After visiting the elephant breeding center, we headed towards the hotel. Some of us took showers first (since we spent two consecutive days doing manual labor at the tower), which was more than refreshing, while some had breakfast first. We then visited Kalpavriksha Greater Goods’s founder and a trained local entrepreneur within Chitwan. All of us were moved by the leadership shown by these women entrepreneurs, and how their work has changed their communities and inspired young women to do the same. 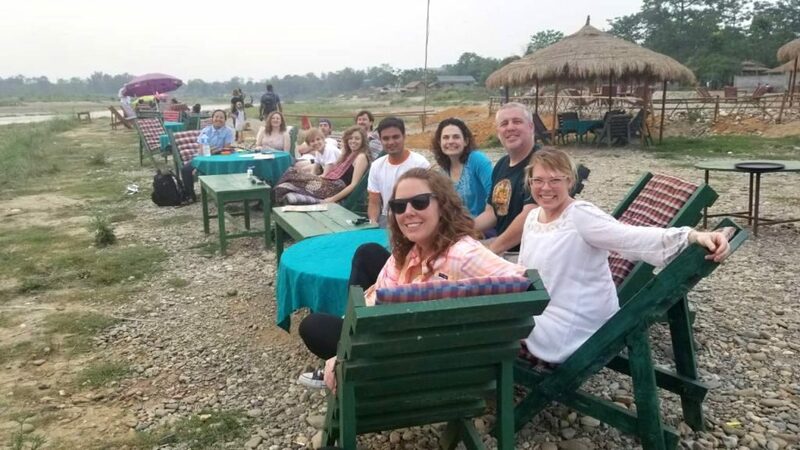 We then walked beside the Sauraha riverside in the evening and had some beverages while reflecting on the trip and the good times we shared together. We then explored more of the town, where participants bought souvenirs and gifts for their loved ones back home. We had dinner together at the hotel, and a few of us stayed after dinner and talked about how the trip had already touched our lives. Everyone was more than happy; they all wore deep proud smiles on their faces. We took flight from Bharatpur next day, which got a bit delayed. However, we did not stop having fun at the airport. Khadak went and bought us all deliciously spicy samosas and sweets. Pikachu (an inflated Pokemon balloon that one of us bought at Patan) stayed with us throughout the trip, and even made it through all the plane flights! We arrived at around 2 pm at Kathmandu Airport and went straight to our hotel. Some of us headed out to buy more gifts, while some were busy planning for their treks starting the next day. We explored more of Thamel and had our last dinner together near the hotel. Afterward, everyone joined the reflection session at the hotel – participants were so proud to have made the journey. It all concluded with a big smile on everyone’s faces and all of us felt encouraged to participate in more of such trips in the future.